Best Wheel Paint for Aluminum Reviews: Top 10 in April 2019! Best Wheel Paint for Aluminum – Buyer’s Guide! So you decided its time for painting aluminum wheels, well, this is a sticky subject, and not because of the paint. I have added a full FAQ on this subject after the review, and I suggest you read up on the methods for applying paint to aluminum surfaces, since this metal is unforgiving and if you do not prepare it before you apply the paint, you will waste your time, your money, your effort and end up with a peeling mess within a few hours. Now let’s take a look at the top aluminum paint brands there are, and before I start with them, I am opening with a primer. Primer is what you will always use before applying paint to an aluminum surface, which you will read about in the FAQ. 4. VHT SP183 Satin Black Wheel Paint Can – 11 oz. 5. 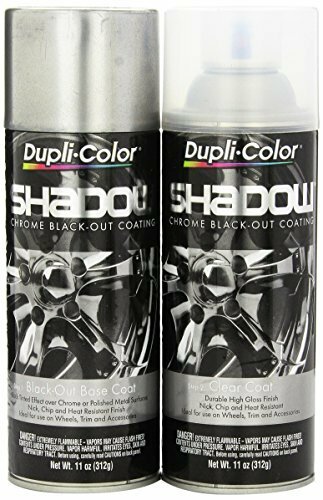 Dupli-Color HWP102 Graphite High-Performance Wheel coating – 12 oz. 7. 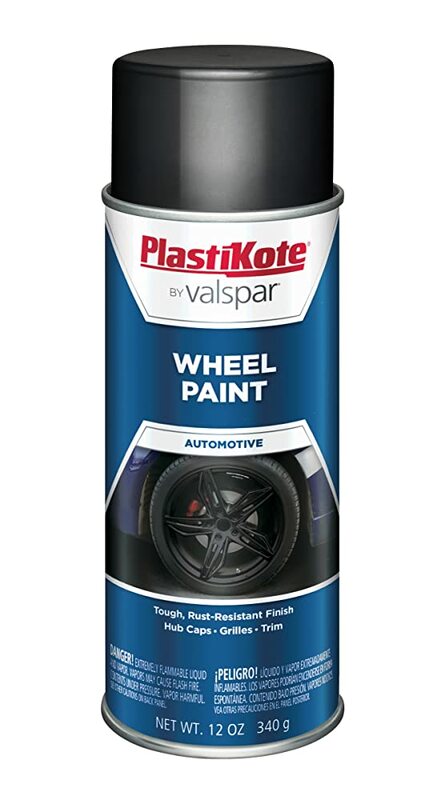 PlastiKote 620 Semi-Gloss Black Wheel Paint – 12 oz. 9. 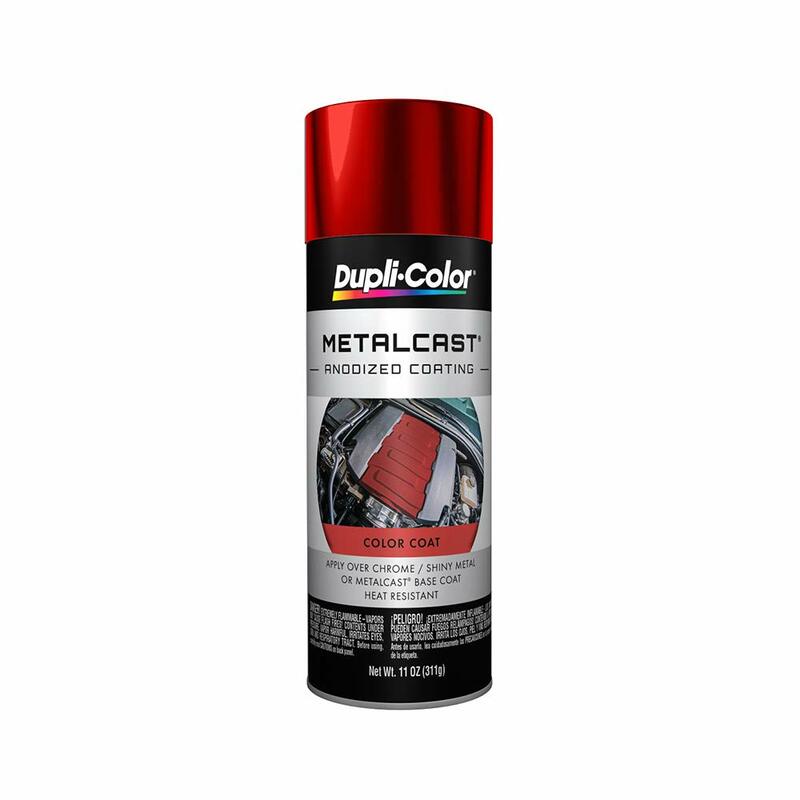 Dupli-Color EMC200007 Red Metal Cast Anodized Color – 11 oz. Rust-Oleum® is a professional brand, well known and this is their Professional Aluminum Primer Spray. This product is a durable, spray-on base coat which will provide the perfect base and high-quality surface for tight-binding a top coat. This product will eliminate any blistering, flaking and peeling. Aluminum is a material that has one of the worst adhesion properties, so using a primer coat before painting is a must. Many people use only a primer as a top coat but it’s a big mistake because the top coat consists of more lacquer and less of toner with other additives while primer consists of more toner with adhesion additives and less of lacquer. That’s why good primers always have a deep matt color while even matt top coat still have some gloss. This product is made of extremely hazardous chemicals, and you should be aware that using it requires proper preparation of the surface as well as securing your safety with eye, nose and mouth protection. It is advisable to use this product in a well-ventilated area, and if you are allergic, then wear full body protection. 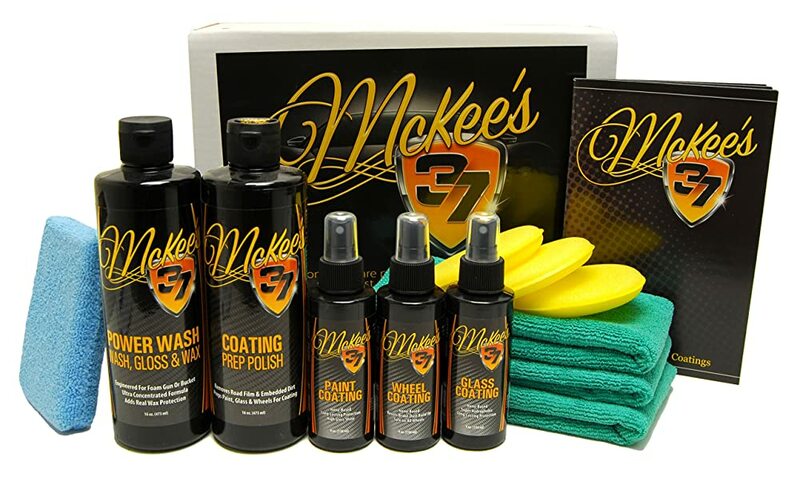 The McKee’s 37 Paint, Wheel & Glass Coating Complete Kit gives you all you need to apply a complete finish to an aluminum surface. What you get is a primer system, that prepares the surface for your various coatings, and this one comes with a full host of surface coatings including a nano-glass ceramic particle product that fills in the microscopic pits and pores of the surface of your vehicle. The surface is then perfectly smoothed for optimized gloss and slickness. McKee’s 37 Coating Prep Polish. This is a non-abrasive chemical polish which you use to deep clean the surface before application of covering coats. McKee’s 37 Sio2 Auto Wash adds to the deep clean; this product will completely remove any dirt particles embedded in even the smallest pores and is a pH-balanced, non-alkaline shampoo that contains water-softeners to reduce spotting. McKee’s 37 Xtreme Iron Remover is used as a spray on to destroy any iron that might be evident on the surface, and you see this when the application turns red, signifying rust. McKee’s 37 Paint Coating is a nano-glass ceramic coating is applied after the paint has been applied. This is a hard ceramic coating that secures your paint in place for years. McKee’s 37 Glass Coating which is applied to any glass surfaces on your vehicle, and will assure that they are crack free and waterproof for years. McKee’s 37 Wheel Coating is another nano-glass ceramic coating that aims to protect your wheel from brake-dust build up, and one application will last for a year. You also get 3 Microfiber Detailing Cloths, 16 x 16 inches, a Poly Foam Applicator Pad, and a Microfiber Applicator Pad. To round this kit off, you also get 2 x McKee’s 37 Coating Applicators which are designed to apply your coats in an even and near perfect distribution of the substance. Dupli-Color® Wheel Coating is specifically designed or wheels. This is a proprietary formula that is applied over any prepared surface that has a primer coating. The final surface coat provides a near perfect resistant surface that protects your wheel from brake dust, chemicals, cleaning solvents, heat, and chipping. With this product, you end up restoring your wheel to its original appearance, and you get a highly reflective metallic finish. VHT Wheel Paint is a fast-drying corrosion resistant paint. When applied correctly over a primer this paint will last for years. It is chemically prepared to harden completely after 24 hours and once set will not fade and resists all standard and extreme environmental conditions. Dry Time: Dries to the touch in 30 mins. The Dupli-Color® Wheel Coating is a bespoke product that is designed specifically for wheel applications. This product is at the top of the line acrylic enamel. When applied over a good surface primer, this paint will protect your wheel from brake dust, chemicals, cleaning solvents, heat, and chipping. This paint can be sued on all wheel materials, including steel, aluminum, and plastic. Shadow® Chrome Black-Out Coating is a specialist material coating that is designed to deliver a completely black coat. This is an exceptional paint and can be used on any metallic and plastic surface, so long as it has been prepared properly with primer. The primer is part of this pack, and what you get is the Shadow® black base coat, over which you paint the clear gloss top coat that protects the wheel from brake dust, road abrasion, chipping, and fading. This paint is not just for wheels, and can, and is used for many automotive applications. The Universal 12 oz. Semi-Gloss Black Spray Can Wheel Paint (620) by PlastiKote® is a wide range coat that is used on many automotive applications. This paint is designed to sit over a base primer, and once it is applied, will provide protection from many elements including, weather, saltwater, oils and Ph-positive, and Ph-negative chemicals. Dupli-Color® Perfect Match® Premium Automotive Paint is designed specifically for all automotive applications, ranging from the body to wheel and internal applications. This pain is OEM specific, so you can restore your vehicle to its original out of the factory look. Always make sure you apply this coat over a prepared surface, and in the case of aluminum, a surface that has a primer coating. Dupli-Color® Metalcast® Anodized Automotive Paint is a unique proprietary paint used to create an anodized color effect. The end product is a bright, transparent-colored metallic finish. Metalcast is a durable rugged and resistant enamel finish which will withstand oil, gas, and heat up to 500°F intermittently. As such, this is a perfect paint coating for any vehicle part surface, ranging from wheels to manifolds. With this product, you have a one-stop internal and external paint solution for all vehicle parts. 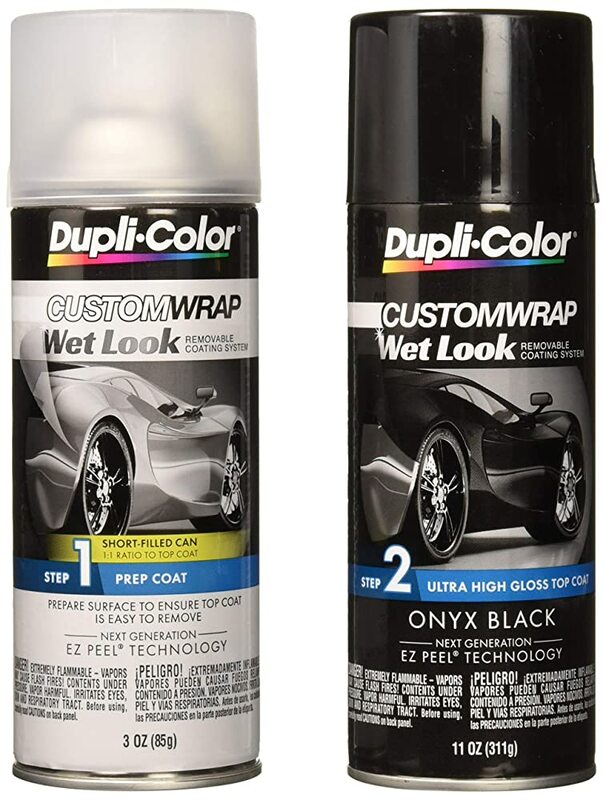 The Dupli-Color® Wet Look Custom Wrap is, perhaps, one of the most sought-after paint finishes in the aftermarket scene. This amazing product was developed over the years, and the EZ Peel® technology is a proprietary formulated product that is used only in the automotive upgrade aftermarket. The EZ Peel® Technology lets you take off an old coat in moments and repaint surfaces without any hassle. What kind of paint can you use on aluminum? No paint will adhere to an aluminum surface. In order to apply paint to an aluminum surface, you must first prepare the surface accordingly. Can you paint polished aluminum wheels? Yes. OEM aluminum wheels usually come with a protective coating, the wheels have undergone treatment before leaving the factory. On some occasions, aluminum wheels do not have a surface treatment and come out polished and anodized, which is a surface treatment that resists oxidization. When applying paint to an OEM wheel, you need to ascertain which surface treatment your wheel has, and then apply the paint according to a specific aluminum pre-preparation treatment. How do you prepare aluminum for painting? First wash the wheel properly, and use 646 or 647 , or dearomatized analogs needed to remove oils and other chemicals. You should use aluminum cleaning brushes and scourers for harder parts, and since you are painting over the surface, the scratches the scourers leave should not be a concern. After cleaning the part, dry it completely. Abrading the surface means to “roughen” it up. This means you want to cover the surface with scratches, or if you have a sand gun, you blast the surface with sand, taking away the smooth finish. If you don’t have a blaster, then use a sander, aluminum sanding paper, and even an angle grinding unit with the appropriate disc. After completing this stage, wash the wheel again and dry it completely. Yup, wear protective clothing and add a thin layer of acid etch, let it sit on the surface for around 3 to 6 minutes, then rinse off with water. This completely cleanses the surface and prepares it for conversion coating. Now rinse the entire part in conversion coating solution and then rinse the liquid off and let the part dry. Conversion coating is a chemical treatment that prepares the surface for its first layer of paint. Before painting, you need to apply a primer paint. Primer paints are specifically designed to adhere to the conversion painted surface, forming a chemical bond that is hard and resilient. Now you can paint the aluminum surface with your final paint coating, or if you use a color base with a clear cover, then two coats. Does paint stick to aluminum? Paint will only stick to aluminum if the surface has been treated, as I explained in the previous section, there are 4 steps before applying the primer coating, so there are essentially five steps to prepare the aluminum surface before applying paint. Best 383 Stroker Build Kit Guide!